So, I'm back from Glastonbury, and apart from a wee bout of sunstroke, it was INCREDIBLE. Probably the best ever. I will be sharing some photos with you later in the week, I'm sure. Right now though, I'm consumed with the world of interiors. I'm moving next week - ahhh! We are so not ready. We have hardly any furniture and apparently the plumbing needs a total overhaul but all I seem able to look at is pretty little things that really shouldn't be prioritised at all. But you know that's what I'll spend most of my money on. AAAACCESSORIES! And Carrie's recent post on getting creative with paper flowers (plus the adorable little hair garland I bought at Glastonbury) has made me want to splash some cash at this store. I'm thinking little posies in vases, and maybe delicate little curtain tiebacks. Lighting-wise, would you believe it, I'm heading to that high street bargain bin, Wilkinson! I noticed a while ago that they have a large selection of chandelier-style lights that are genuinely really nice. There are a lot that are really just ornate lampshades. 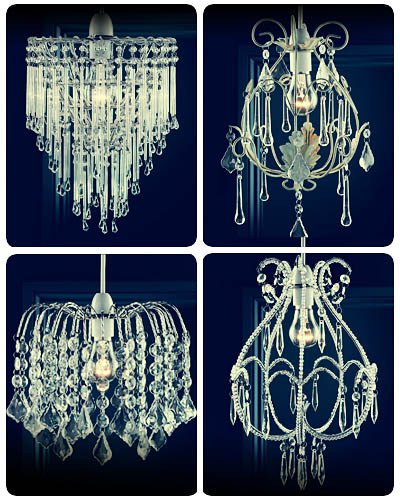 So you don't have to mess around with lots of special bulbs, you can get glam lighting from just one normal bulb. This totally appeals to my lazy side. My lazy side is like 80% of me. Also, I'm pretty sure all of the above are under £20. Bargain! I've also found some lush duvet sets in BHS! Who would think? It just goes to show that sometimes the places you wouldn't think of on the high street have really nice - and often bargainous - finds. 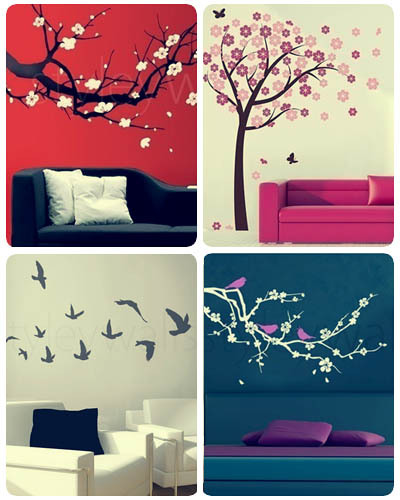 I had plans to get some pretty cherry blossom wallpaper for a wall in my bedroom, but then when I started searching Etsy, I fell a bit in love with the wall decals from this shop. However, when I was balking on Twitter at the high price tags on some of the loveliest examples on there, my friend Lenny bopped me over the head and pointed out that painting them myself really shouldn't be an issue. So... let's see how that goes! Finally, I'm looking everywhere for a reasonably priced desk. The problem is, the more I've thought about it, the more I don't WANT a desk. I want this. I can't WAIT to get in there and get started making it over. It's going to be so much fun! I'll certainly be showing off all my purchases over the coming weeks, and our progress. SO EXCITED. 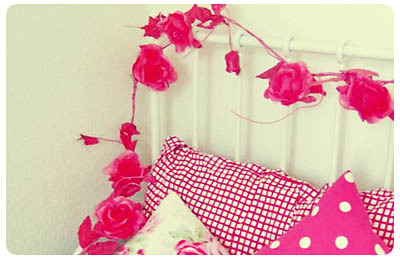 Oooh now I want to paint my walls and put up decals. I hope you're going to keep us up to date with what's going on in your new house - from the looks of this, it's all going to be SO gorgeous! Right, I'm off to check out that eBay shop you've linked first..
That vanity table is so beautiful! I need it in my life! 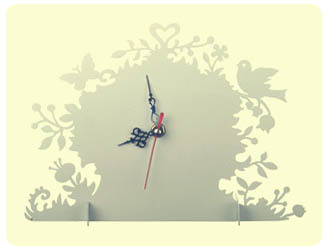 I love looking at home accessories. As my flat is rented I can't do any painting/major decorating so I love getting lots of pretty bits and pieces to make it look nicer. 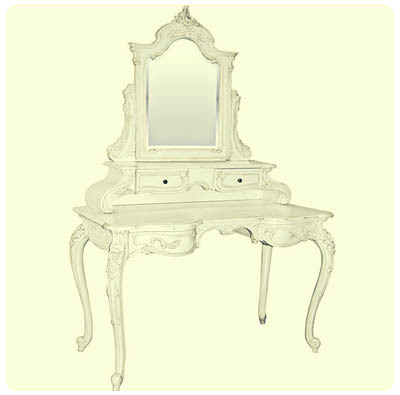 The first thing I'm going to buy when I move into a bigger bedroom is a lovely vanity table with a mirror. That one is gorgeous! Aw so glad you're home and had a great time! I love that ebay shop!! Thank you for the heads up! exciting times, moving in. I secretly love moving! I've got some new Etsy wall decals! Going up this week, a peacock and a bird-filled tree. Getting by at Glastonbury: Essentials. Getting by at Glastonbury: Looking Presentable! Having a New Look moment. How to fill three days off.